Otsuka and GW Pharmaceutical’s multiple sclerosis drug Sativex has failed to meet the primary endpoint in its first Phase III trials in cancer pain. Sativex (nabiximols) is derived from cannabis and usually used to treat the symptoms of multiple sclerosis (MS). This trial was testing the drug for the treatment of patients with advanced cancer where opioid therapy does not adequately reduce their pain, but it did not demonstrate a statistically significant difference from placebo. In Phase II trials however, Sativex did show such improvements using the same primary measure as in the Phase III trial. "Although we missed the primary endpoint in this trial, based upon the positive data seen in the Phase II programme, we remain confident in the ability for Sativex to relieve cancer pain in this patient population,” says Justin Gover, GW’s chief executive. The second Phase III trial is expected to report top line results in the second quarter of 2015, while the results of the third are set to come in at the end of the year. This is the second setback for Sativex in recent months, after NICE ruled that the drug was too costly to be used in England for its original indication of spasticity due to MS.
Dr Paul Cooper, who chaired the watchdog’s guideline development group, told the Guardian that “The substantial cost of Sativex […] compared to the modest benefit does not justify its use; there are better ways to improve care for people with MS”. 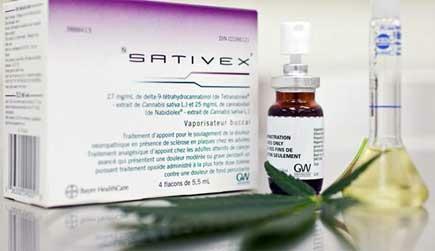 Sativex, the world’s first plant-derived cannabinoid prescription drug, was developed by GW with Otsuka acting as a licensing partner for the US. It is currently approved for MS in 27 countries outside the US, and a request for Special Protocol Assessment has been submitted to the FDA for a proposed Phase 3 study in this indication. Doctor Marie Fallon, the principal investigator of the trials added: “We believe that cannabinoid therapy offers a potentially novel approach as a co-analgesic to provide pain relief beyond opioid therapy. Too many patients with advanced cancer do not attain adequate pain relief from an opioid regimen, or experience unacceptable opioid side effects. It is not all bad news for GW though – the company also announced that all of its trials for the children’s epilepsy drug Epidiolex (pure cannabidiol) are on track or ahead of schedule, with Phase III results now expected by the end of 2015.